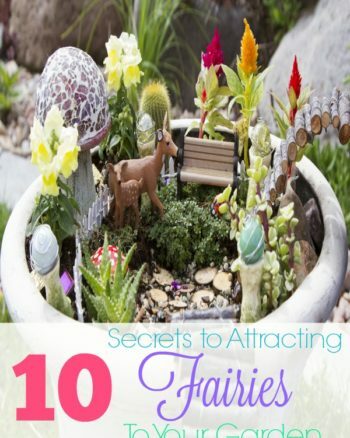 If you are new here you may not know about my love for all things Fairy Garden and Unicorns. 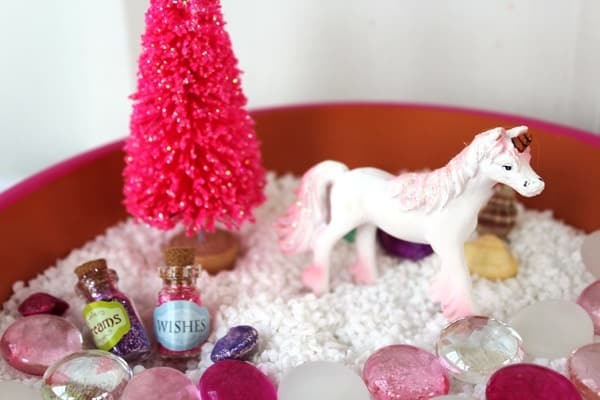 But if you like then too my Unicorn Fairy Garden will give you all the squeals. 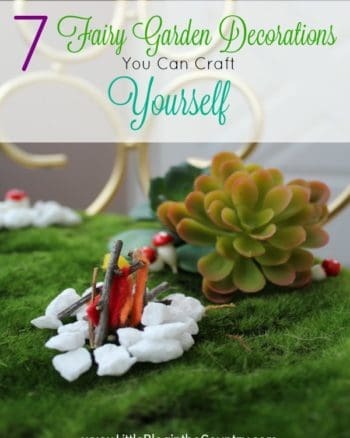 If you’re a crafter or Fairy Garden makes, you probably already have several of the items laying around the house that you can use. 1. Begin by applying pastel paint (such as pink or purple) to the rim of the saucer. Allow it to dry. 2. Fill the saucer ¾ of the way full of white filler. Smooth and spread it out so the surface is even. 3. Begin arranging the embellishments. Create a walkway with the glass stones and arrange small shells or other small colorful pieces around it. 4. Place the pastel tree towards the back, so it doesn’t obstruct anything. 5. Add in the other accessories such as the ting magic bottles. You can move these around as you wish. 6. 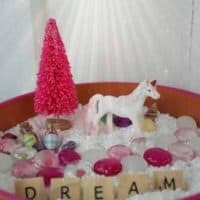 Arrange the tiles to spell out a fun word such as “WISH” or “DREAM.” Arrange the tiles upright in the filler. 7. 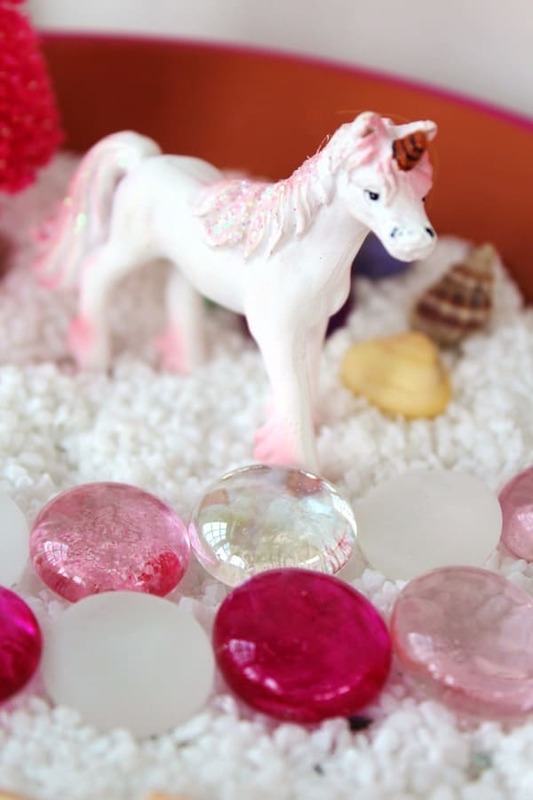 You can now place the unicorn inside of the fairy garden. 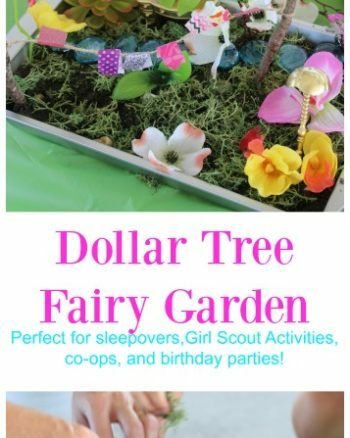 Avoid gluing any pieces into place so that children can play with the garden as they wish. Begin by applying pastel paint (such as pink or purple) to the rim of the saucer. Allow it to dry. Fill the saucer ¾ of the way full of white filler. Smooth and spread it out so the surface is even. Begin arranging the embellishments. Create a walkway with the glass stones and arrange small shells or other small colorful pieces around it. Place the pastel tree towards the back, so it doesn’t obstruct anything. Add in the other accessories such as the ting magic bottles. You can move these around as you wish. 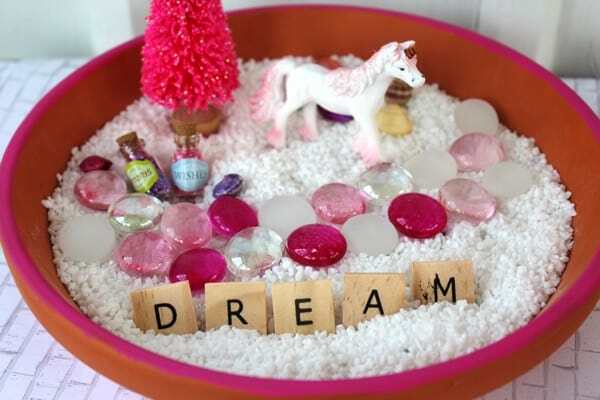 Arrange the tiles to spell out a fun word such as “WISH” or “DREAM.” Arrange the tiles upright in the filler. 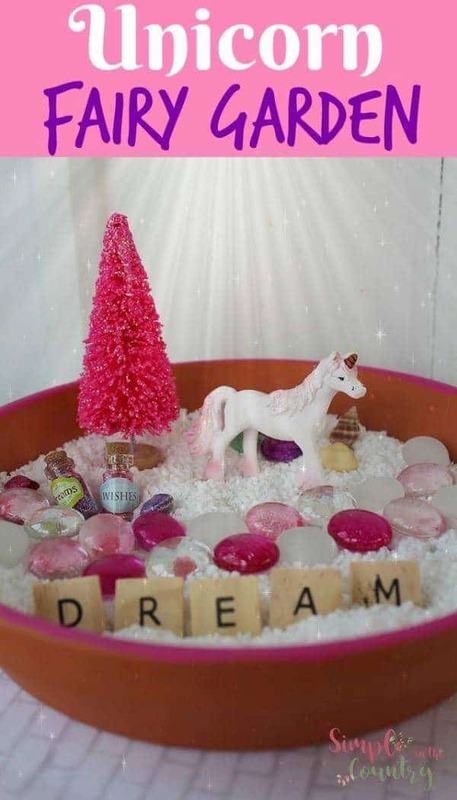 You can now place the unicorn inside of the fairy garden. Avoid gluing any pieces into place so that children can play with the garden as they wish. That’s adorable, where do you get the little bottles at? Hi Marian, thank you so much for stopping by. 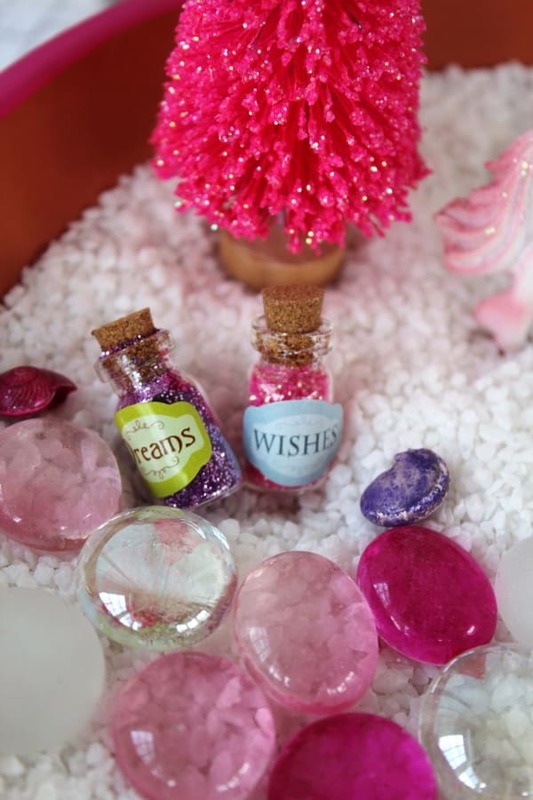 The bottles used in the Unicorn Fairy Garden were purchased st Micheals. I’ve linked some similar on Amazon in the post. This is a cute unicorn garden. My kids are all about them right now and I like the little bottles you added. Thanks for linking with us at #OMHGWW! How fun! I saw this post on Over the Moon at Marilyn’s Treats and had to check it out. 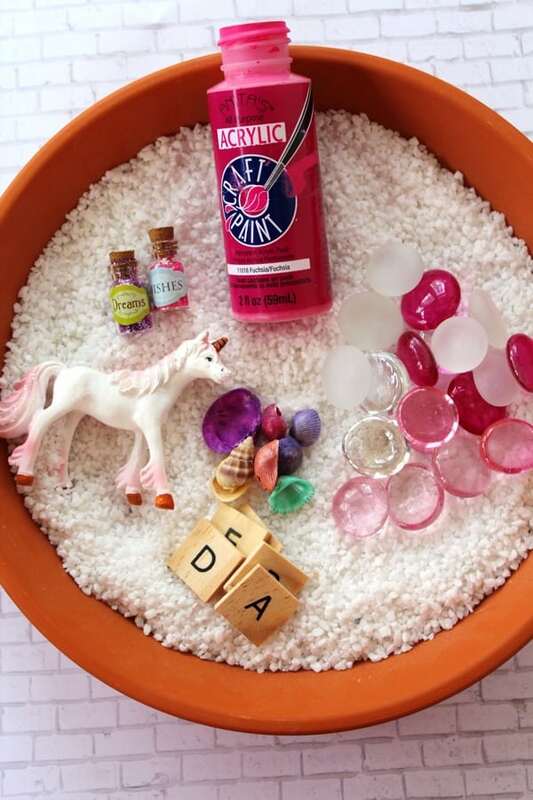 One of my granddaughters loves unicorns, so I think I’ll make one of these with her. Thank you so much for the great idea!